FIBR Supports Community! In the aftermath of Hurricane Katrina, for example, many members donated product and headed humanitarian efforts. FIBR has also supported various community-based events throughout the years. Each year, FIBR also honors a "Community Partner of the Year" for demonstrating exceptional community investment. FIBR members understand the importance of helping to shape the future of the industry and contributes to the next generation in a number of ways, including our work with Dorsey High School, Los Angeles Trade-Tech College and a soon to be established, FIBR Internship Program. The Dorsey Culinary Arts Speaker Series sends speakers to this Los Angeles inner-city school to inspire high school students and expose them to the myriad of careers available in the food processing industry. Business Owners, Microbiologist, Food Inspectors, Quality Assurance Professionals, Chefs, Authors and others selflessly give their time and share their career and life experiences in this program. The FIBR LATTC Advisory Committee serves as advisors to the faculty at Los Angeles Trade-Technical College's Culinary Arts and Professional Baking Programs. The Committee provides guidance and feedback about existing and future curriculum to better prepare the industry's workforce. FIBR also works in co-operation with the LATTC Culinary Arts Program to present its annual awards dinner, A Taste of FIBR. The dinner is hosted on campus and is created by the students using FIBR member products. The project connects students to the manufacturing sector, challenges their creativity and provides a professional experience. 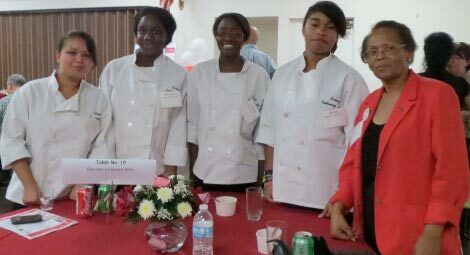 Additionally, FIBR has established two FIBR LATTC Scholarships annually to benefit deserving Culinary Arts Students. FIBR is currently developing a committee of FIBR student and Core members to establish a meaningful FIBR Internship Program that will benefit FIBR's members and future food industry professionals. FIBR is also a partner with CDTech, a non-profit community economic development corporation. Since 1997, CDTech has supported FIBR with in-kind support and has developed innovative programs that have benefitted our industry including the Worker Income Security Program and the Green Urban Manufacturing Initiative. CDTech also supports FIBR by advocating both the economic benefits of manufacturing and the importance of the food processing sector in creating and retaining jobs in underserved communities. In return, FIBR has supported their programs and helped provide an industry focus groups and information resource that benefits CDTech's mission. Community Partners Celebrate at A Taste of FIBR! FIBR’s annual dinner provides an opportunity for FIBR’s community partners to come together. 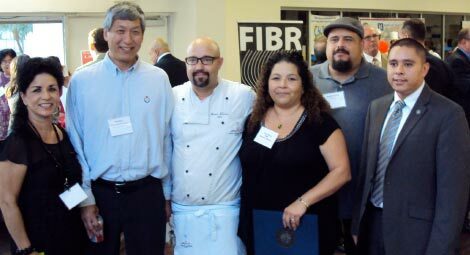 Pictured from left to right: Helene Martinez of FIBR; Mas Hori, FIBR Board Member; Chef Steven Kasmar, Department Chair, LATTC Culinary Arts; Yvette Nunez of FIBR; Benjamin Torres, President of CDTech; and Ricardo Mendoza of U.S. Congresswoman Lucille Roybal-Allard’s Office. LATTC Culinary Arts Students Receiving Recognition! Pictured here are some of the many students and faculty it takes to make our Annual A Taste of FIBR Dinner a success! FIBR’s event is in the evening, which means all of these future Culinarians are volunteering their time well into the evening! Pictured here are some of the Dorsey Culinary Arts students who volunteered to help make our Taste of FIBR dinner a success (some not pictured were busy helping set up the Ice Cream social). Ms. Erevetta Marzette (far right) is an exceptionally dedicated instructor, mentor and role-model for her students. 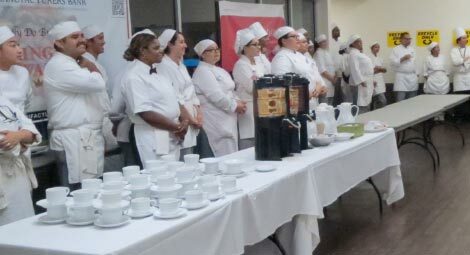 The FIBR LATTC Advisory Committee serves as advisors to the faculty at Los Angeles Trade-Technical College's Culinary Arts and Professional Baking Programs. The Committee provides guidance and feedback about existing and future curriculum to better prepare the food processing industry's workforce. Several Certificate programs have resulted from advisory committee suggestions. As part of FIBR’s investment in the LATTC Culinary Arts program, FIBR established the FIBR LATTC Scholarship Fund at our 2011 A Taste of FIBR Awards Dinner. FIBR awards scholarships to deserving Culinary Arts graduating students. Scholarship recipients receive a cash award and a two-year membership in FIBR. FIBR will be announcing the details of this program in the near future!